The author was widely thought to have the most design sense of all the 'TV gardeners' who graced British TV screens during the 1990s. 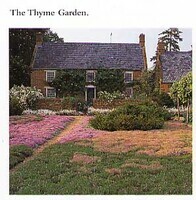 This book records his work at the 4-acre Home Farm in Northamptonshire between 1987 and 2001. It is beautifully illustrated with photographs by Nicola Browne. Pearson was only 22 years old when he began work on the garden, for a friend of his mother's. The site was a derelict farmstead and 'There was a stillness here' (p.11). He and the client loved its wildness but also wanted to established some order 'To garden with nature, a pact has to be made and this pact is based on common sense. Wherever possible nature is given free rein so that the ecosystem is allowed to develop'. (p.20) The garden plan (p.26) is poorly drawn and remarkably undistinguished, closer to the Arts and Crafts Style than anything else. For client and designer, the main thing was the planting. This was beautifully handled. A section on The Narrative, shows the key role which words can play in design - the importance of plans is generally overrated by designers. Names like 'The Woodland Garden', 'The Lime Enclosure', 'The Thyme Lawn', 'The Circuit and Tom's Wood' have set a clear intention and allowed a clear design to emerge. All this is set forth in the first 38 pages of the book. The remainder of the pages are occupied by an appreciation of seasonal effects, beautifully illustrated and intelligently discussed. For January, Pearson makes the interesting point that 'It is all too easy to view winter as a time of hardship, the barren season... The garden is, in fact, the very thing that will entice us outside to experience the potency of this season'. This truth is a key factor in explaining the character of English gardens. In lands with a continental climate, the snow is too deep to work the soil in winter and the sun to hot to do much in mid-summer. In England it is hardly ever too cold to stop or warm enough to rest. One therefore has to keep going and this explains much of the character of English gardens: they are places of constant activity. Pearson and Browne use this book to explain the nature of the effort required to produce the beautiful planting effects for which England's gardens are renowned. One must congratulate them on their achievement, while pointing out that a better plan, and a more vital design concept, would have resulted in an even better place.